Siena College student 'Marie Cherry Inzon' died after pinned under the truck cement mixer. The accident happened along Araneta Avenue, Tuesday morning, April 23, according to the report by ABS-CBN News site. 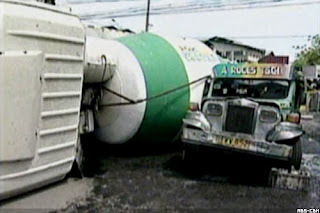 Siena College student died after pinned under the truck cement mixer along Araneta Avenue. Seven people were reported injured. 5 of them were rushed to East Avenue Medical Center while the two others were brought to Philippine Orthopedic Center. The accident happened when the speeding truck hit the jeepney that was unloading passengers. Reynald Guarte is the mixer driver of Concrete Mix Specialist Inc., he was arrested. Traffic investigators have yet to determine how the accident occurred. For the meantime, If you like this information, please bookmark it now or visit this site more often for you to be updated. You may also share this post to your friends so they may know about Sienna College student crushed by truck mixer. Comments or suggestions about "Sienna College student crushed by truck mixer in QC" is important to us, you may share it by using the comment box below.